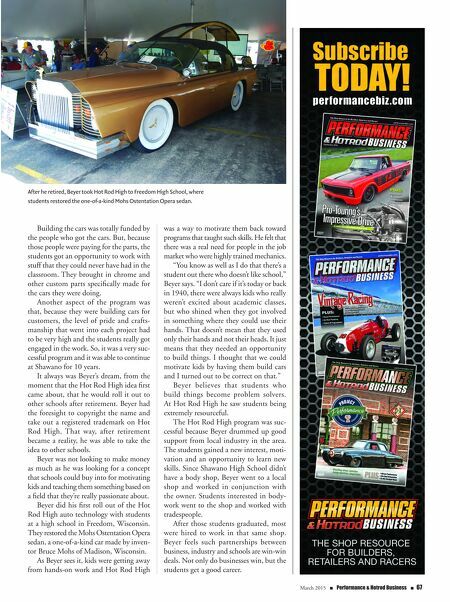 66 n Performance & Hotrod Business n March 2015 HOTROD H ot Rod HigH (www.hotrodhighusa. com) started at the high school in Shawano, Wisconsin. Fred Beyer was an automotive shop, machine shop and weld- ing instructor there for 36 years. Beyer realized his shop students were walking away from the skilled trades. They were getting more involved in hands-off, computer-simulated types of instruction. Beyer felt his school needed to do some- thing that would get students motivated. Through his love of cars, he created Hot Rod High. 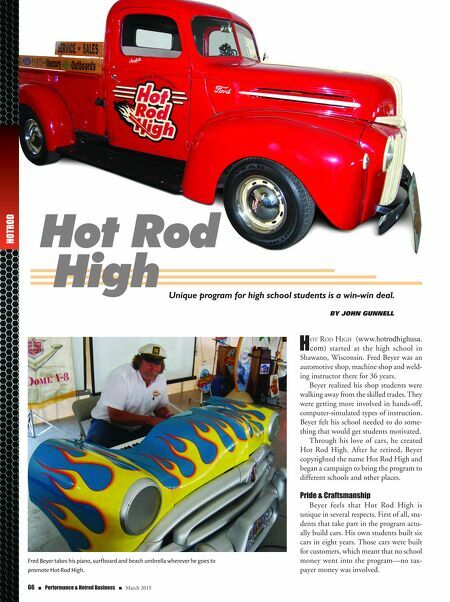 After he retired, Beyer copyrighted the name Hot Rod High and began a campaign to bring the program to different schools and other places. Pride & Craftsmanship Beyer feels that Hot Rod High is unique in several respects. First of all, stu- dents that take part in the program actu- ally build cars. His own students built six cars in eight years. Those cars were built for customers, which meant that no school money went into the program—no tax- payer money was involved. Unique program for high school students is a win-win deal. By John Gunnell Hot Rod High Hot Rod High Fred Beyer takes his piano, surfboard and beach umbrella wherever he goes to promote Hot Rod High.